primary pump သည္ ေရ ကို chillers သိုမဟုတ္ boilers တြန္းပို့သည္ တာဝန္ကို ေဆာင္ရြက္သည္။ (secondary pumps ရွိလွ်င္ Coil အထိေရာက္ေအာင္တြန္းပို့ရန္မလုိအပ္ေပ). 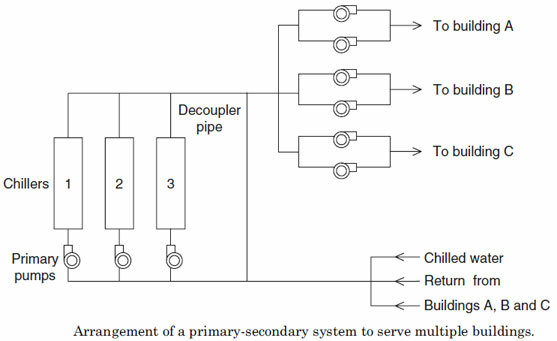 the primary system produces more chilled or hot water than what the secondary system consumes, the flow of water in the decoupler pipe will be from supply header to return header. with building load while maintaining a constant flow of water through the primary circuit.